For the most part we have hit the ground running when we've arrived in new places, but our start in Melbourne was a slow one. Our flight from Auckland didn't get in until almost midnight and the following day was a soaker. Bright and early the next morning we got the best possible introduction to Melbourne with our free tour of Town Hall. Our fantastic tourguide Ken is clearly an institution there, and he showcased the beautiful building with tons of great anecdotes and city history. We saw the largest pipe organ in the Southern Hemisphere (with a price tag of 9 million AUD), the balcony from which Ringo Starr tossed out a golden boomerang never to be seen again, and a stunning silver tea set specially made for Queen Elizabeth's visit decades ago but never used since she opted for water instead. It was while he was bantering with the Deputy Lord Mayor about the upcoming footy finals series that Patrick decided we really had to attend a match. We arrived in Melbourne at the height of footy fever. In general the city is the hub of Australian Rules Footb all enthusiasm, but this week in particular was a special one with both preliminary final (or what we call semifinal) matches being held during our stay and the Grand Final the following weekend all at the hallowed Melbourne Cricket Grounds. 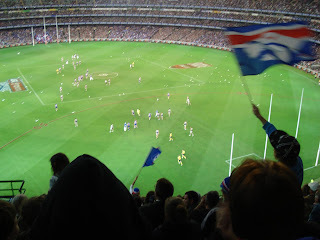 We bought tickets to see the St. Kilda Saints play the Western Bulldogs and learn what the hype was all about. First off the stadium is like nothing we'd ever seen: some 100,000 people surrounding a massive oval field. Thirty-six players are on the field at once, running back and forth, side to side, and shoving each other around at every opportunity. It was an intensely heated match that came down to the last minute, but despite Western fans cheers of "Come on doggies, get hungry!" the Saints are marching on to next weekend's finals. 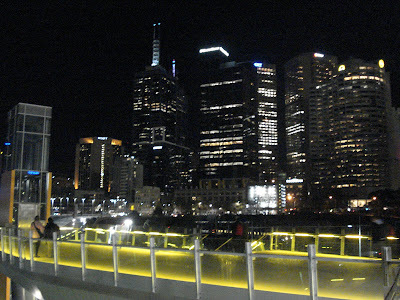 But aside from watching footy, there is certainly plenty to keep the non-sports fanatic busy in Melbourne. 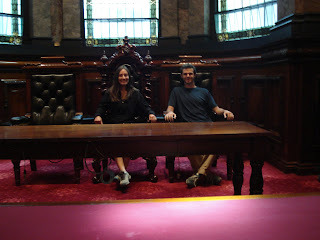 Our walking tours included the Parliament building, St. Patrick's Cathedral, Old Melbourne Gaol (historic jail), Royal Exhibition Building, numerous beautiful public parks, and the bustling Queen Victoria Market--crazy bargains at closing time. There are several free museums as well; the Koorie Cultural Center has beautiful Aboriginal art on display and a fascinating collection of regional flags, the NGV International art museum has three impressive floors of exhibitions from around the world, and the brand new, interactive Australian Center for Moving Images in Federation Square had just had its ribbon cut by Cate Blanchett and Geoffrey Rush while we were in town. Ken tipped us off on Melbourne's free panoramic view secret and we headed over to the Shrine of Remembrance to enjoy them. The CBD (Central Business District) is surrounded by a ring of neighborhoods known as the City Fringe. 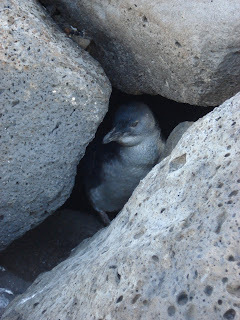 We spent lots of time wandering these areas...Carlton's massive restaurant row on Lygon Street, the funky shops and cafes in Fitzroy, and the chill beachfront of St. Kilda where we spotted nesting penguins in the rocks along the pier. We stayed in North Melbourne whose main street is fairly small, but is home to some great bars. We enjoyed a leisurely drink at The Rrose (sic) and some jugs (pitchers) of Carlton draught at Sheezle during the second preliminary final footy match. This sport-crazed city, with a strong sense of colonial history, culture, and urban parks certainly reminded us of home. We weren't at all surprised to learn that Melbourne and Boston are sister cities. And we mean sister the way that city governments mean it, which is more meaningful we think. View more phots from Melbourne here. I'm from Melbourne so it's always interesting to read what other people think of it and what they get up to whilst there. It tends to be pitched against Sydney which is in some ways silly because they're just different, and people ONLY seem to compare those two cities - no others.